My summer as the Marketing Summer Associate for the UPMC Health Plan has been completely rewarding and unforgettable. I credit this not only to the work that I put into the position, but also to my unendingly supportive co-workers. UPMC Health Plan is part of the Insurance Services Division of UPMC and is the second-largest health insurer in western Pennsylvania. It includes a huge provider network and serves nearly 2.3 million members. To effectively communicate and serve that large of a member population, our marketing department is extremely vital to the operation. With over 50 employees, this department works like a well-oiled machine that produces mass numbers of campaigns, events, articles, print materials, newsletters, digital media, social media, sponsorships, partnerships, and so much more. Every person in this department, from writers to campaign managers to editors to designers to digital media experts, works together to form an amazing team. With the help of my attentive and awesome manager, I had the opportunity to work in almost every area of the marketing department. Throughout the summer, I worked on nearly one hundred writing and editing assignments for Creative Services and Campaign Managers. With the Design team, I helped with photo shoots and received InDesign training. A Community Relations co-worker even had me write talking points for Charlie Batch from the Pittsburgh Steelers to present at an event. 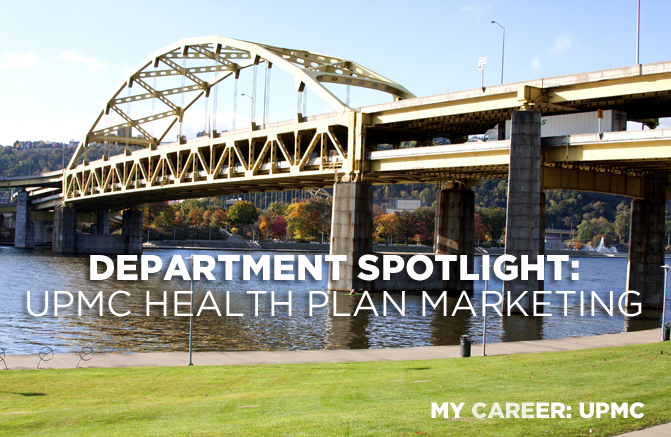 For Digital Marketing, I helped with the complete overhaul of the UPMC Health Plan website by writing content, brainstorming ideas for design and layout, and learning SEO practices. I also designed images for and wrote the weekly blog e-blasts, and I had the opportunity to help with various video shoots and editing. From the first time I stepped foot in the office and sat down at my desk, I felt like an important part of the team. My co-workers made sure that I learned something new every day and inspired me to do my best. They supported me in all of my projects, and I even presented my kick-off presentation to about 30 members of the department, who took time out of their busy days to come learn more about me. I was never treated as merely an “intern,” and I am extremely grateful for the experiences I had this summer.